Just in time for Valentine’s Day! 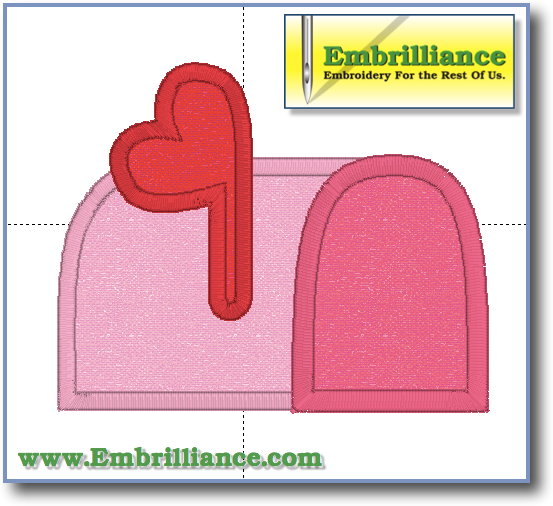 This Love-ly Mailbox applique design was created by Tiffany L., who is one of our Brilliant Embrilliance Facebook Group members. She created this applique design using StitchArtist and has graciously provided the BE working file as a free download on the Embrilliance project blog! Thank you, Tiffany! If you are learning to digitize with StitchArtist, you can open this working file in Create Mode to see how she used the Applique > None style to allow her to create finishing stitches that do not create ‘bumps” under other applique pieces. When digitizing, you have complete control over where and when the stitches are created! Click the link above to download the zipped file! Enjoy! Posted 1 year, 2 months ago at 10:44 am. "I absolutely love how user-friendly these programs are!"